I took up running during in the spring of 2014. As I was never physically active and health issues run in my family (hypertension, diabetes, hyperthyroidism), therefore I decided to do something about it. As a full-time working mother of three, I don't have time to run but I make time because they look to me as their role model. Previously, I thought I was always "too busy" with work and life in general, but that's not a good excuse! I picked running because I always saw other runners and wished I could run like them. I wanted to take up a sport that I could do on my own, at my own time, my own pace. 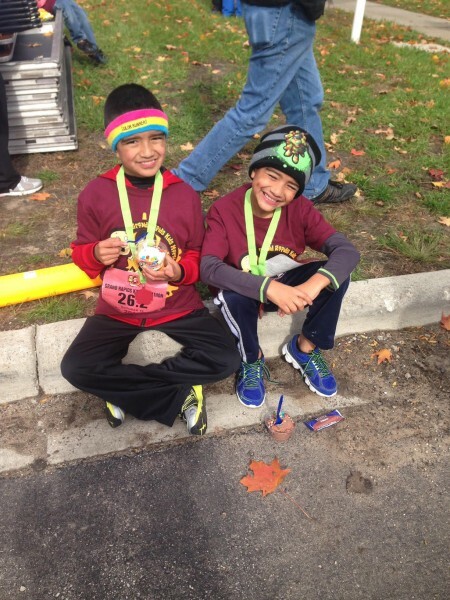 I could also use more energy to keep up with my kids and running was the perfect choice for me. When I started, I had the support of my husband and shortly after he even started running with me! Nowadays you can see our whole family running together on a regular basis around our neighborhood, complete with our 9-month-old daughter Emma in her running stroller! I run about four to five times a week, and we try to run together at least twice a week. To make time as a family, we often run together after work, either before dinner or a couple of hours later. 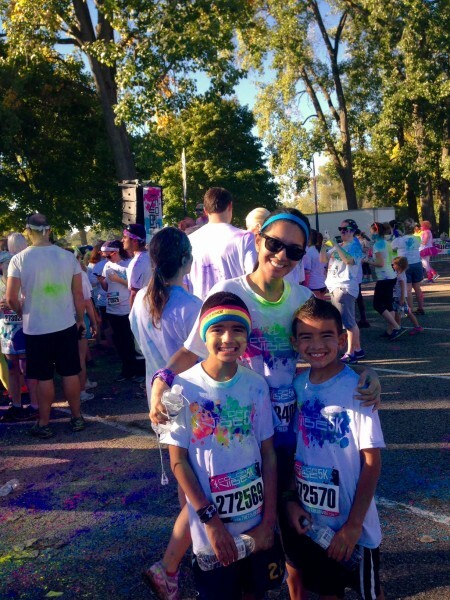 During my running journey over the last few years my boys (9 and 10 years old) have been very excited about running with me at races such as The Color Run, The Color Vibe and the Kids GR Marathon. 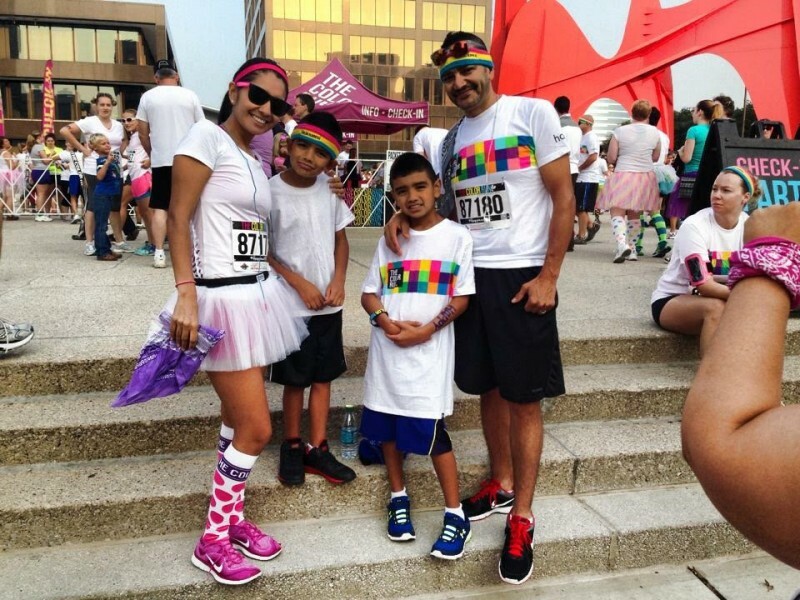 Themed races are a perfect way to get started on a running journey as they are a ton of fun! They get so excited about running now that they leave mom behind because they are so fast! I am pleased to say that they mirror what I do and decided to sign up the 5k River Bank Run event while mom runs the full 25K for the first time ever! I am very excited about running the Fifth Third River Bank Run after running the Gazelle Girl Half Marathon to earn my double medal. I loved running so much that I found myself sad after a quick 5K run/race. I joined longer races because I wanted the run to last longer so that I could enjoy it longer! I have only done half marathons, but my marathon goal is for fall 2017. My best half-marathon was in the fall of 2014 at the Metro Health Grand Rapids event with a time of 2:08, which exceeded my personal goal for my first half-marathon! I find that running has helped my family physically (my husband lost over 40 pounds) but also our relationships with each other, as I get to find out more about my kids during our conversations while running. Not only did my immediate family start running shortly after I did, but so did a few other family members and friends. My sister and parents have come to my races several times which means the world to me. Running is now part of all our lives. It is what we do to stay healthy and strong; we don't take for granted that we are able to run and embrace our ability daily!